This line, as odd as it may seem considering his situation every year, has been uttered multiple times by Yankees GM Brian Cashman, in response to various questions ranging from “Are you worried about how your team is playing heading into the playoffs?” to “How much do you concern yourself with winning the division if you have already clinched at least a wild card?” “Just get in the tournament,” is his line. And, that is what the Phillies, with a win or a Braves loss, will do tonight. 2000 Yankees: When you think about it, you probably think, like I did, “what a great team that was.” They had won three of the prior four championships, and featured a core of the game’s elite players. But, what if I told that they only won 87 games, and that every other playoff team that year plus the Cleveland Indians, who didn’t make it, won three more games than the Yanks? There was also a lot of talk about just how awful the Yanks were playing heading into the playoffs. And, they got in the tournament and won. 2001 Diamondbacks: This was a very good team, but certainly not the favorites (winning fewer games than both the Astros and Cardinals) and, most definitely, not without their question marks. They had acquired Schilling in midseason and after the top two pitchers, they really had no one. And, need I remind you of the name Byung-Hyun Kim? Yes, he was their closer. But, they got into the tournament. 2002 Angels: A wild-card team that was led by David Eckstein and those stupid Rally Monkeys. Not exactly a recipe for over-confident fans, huh? Oh, and you might say, “Yeah, well they did have a dominant closer in Francisco Rodriguez.” And, you would be right–he was dominant in the playoffs. But, entering the 2002 playoffs, he had ZERO career saves, and was only 20 years old. But, they got into the tournament. 2003 Marlins: Another wild-card team that finished ten games behind the Braves in the NL East. Yes, they were playing great ball in the second half, but do you think anyone on September 30, 2003, would say “You know who I’m picking to win it all? The Marlins.” Probably no one other than the 14 die-hard Marlins fans. And, maybe Brian Cashman, who realizes that it’s all about getting into the tournament. 2004 Red Sox: They had not won in 86 years (in case you forgot) and lost the division to the Yankees–a division title they probably should have won, but limped through September and ended up as the wild card. But, they got in. 2005 White Sox: Here is where is starts to get even better. The White Sox took the lead of the AL Central in late-April and never looked back–sort of. They did lead for almost the entire season, but if you don’t recall, they almost choked away the division to the Indians in the final month. They had a questionable closer, no momentum, and no pedigree. But, what did they do? They got in the tournament. 2006 Cardinals: This might be the absolute best example of the point I’ve been trying to make for far too long here. The Cardinals won 83 games in the regular season. They BARELY held on to a division and avoided the “worst collapse of all-time,” as all the sports writers dubbed it as it was happening. They were also called the “worst playoff team ever.” Oh, and their closer? It was Jason Isringhausen up until mid-September when he blew his 10th save and was replaced as the closer. The Cards turned to a rookie starter to be their closer (Adam Wainwright, meet JA Happ) and the rest is history (including a nasty, nasty curveball that Mets fans probably remember all too well). They got in the tournament, and despite all their warts and baggage, they won it all. 2007 Red Sox: Probably the best (or one of the best) team in the league, but they didn’t exactly finish strong either. Plus, they had a closer, who was a starter in the minors, in only his second season as a closer. But, they got in the tournament. 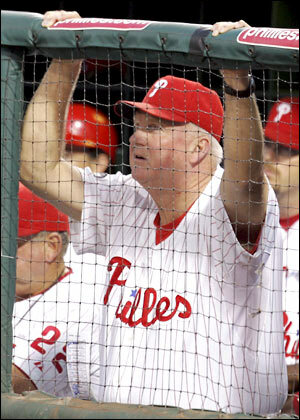 2008 Phillies: It is great to think of all of this happening to these other teams. The White Sox and Red Sox breaking their long streaks of ineptitude. The Cardinals winning 83 games, but somehow winning the title. The D-Backs winning their first. The Marlins winning their second (having NEVER won the division). But, that is just stuff that happens somewhere else. Not in Philadelphia, right? Wrong. Last year, for those who don’t know, the Phillies won the World Series. And, trust me, they were not the favorites going into the playoffs. But, what they did was exactly what they are about to do this year–THEY GOT IN THE TOURNAMENT. So, let us not worry ourselves with closers or slumping offenses or breaking-down starting pitchers. Let us not worry about 1964 or Mitch Williams or anything like that. Let us celebrate the next Phillies victory as if they accomplished EXACTLY what they needed to accomplish through the 162-game season. They, like seven other teams will, won the regular season. There are 8 winners and 22 losers, and with one more win, the Phillies will assure themselves a place as one of those winners. They will, simply put, get in the tournament. Peter Gammons is one of the best sports journalists of his time, and he seems like a pretty cool dude too, but I have to disagree with his suggestion that the MLB should consider expanding the playoffs to 10 teams. His basic argument is that baseball has been lost amid the start of football season this year, with no one paying attention because the only pennant race is between the Tigers and Twins in the AL Central. First of all, let me say that I’ve always liked the addition of the Wild Card in 1995. I’m not an anti-change purist. It’s added a lot to the excitement of September and it’s made it more fair for teams that play in tough divisions, like the AL East. But adding another wild card to each league is going too far. Baseball teams play a grueling, marathon season of 162 games, and to further dilute the season by opening up more playoff spots just seems like a bad idea. Under the proposal Gammons talks about, the two wild card teams from each league would play each other in a best-of-three “play-in” series. That’s better than giving two teams a bye or something like that, but it’s still problematic. We’ve all seen how anything can happen in a best-of-five series, what would a best-of-three be like? Not that I like to defend the Red Sox, but right now they’re 7 games ahead of the Rangers. Should they really have to put their season on the line in a best-of-three series against a team that they were that much clearly better than over 162 games? I say no. Beyond those reasons though, the notion that September baseball isn’t exciting enough is just plain wrong. As Gammons says in the article, “…this may be an overreaction to a September in which there are essentially no races.” Yes, Peter, that’s what it is. Maybe it’s just because I’m a Phillies fan, but I seem to remember PLENTY of excitement in September this decade. To confirm, I went back and looked at the standings with 10-15 games left over the last four seasons. In that time, there were 24 division titles won, and exactly half of them were still up for grabs at that point of the season. Of the 8 Wild Cards won in that span, 5 of them were still undecided. So clearly, the lack of drama this September is a pretty rare occurence. The system is working well, let’s leave it exactly how it is. Who is a better matchup for the Phils in the Division Series–the Rockies or the Dodgers? Is It Possible to Know Any LESS About an NFL Team After Two Games? Now, I know it’s only two weeks into the season, so no fanbase really knows anything about their team (and I do cringe at the knee-jerk reactions that take place this time of year), but some fanbases are pretty sure about certain aspects of their teams, and just about all of them have, at least, some impression of their teams. Saints fans are pretty sure that their team has a potent offense. Jets fans are pretty certain that their defense is stout. Fans of the Bucs, Rams, and Chiefs are probably pretty confident that their teams stink. All three Jacksonville fans are probably convinced that their team is heading for Los Angeles sooner rather than later. But, what do we Eagles fans know? Anything? I’m not sure we even have any impressions of our team after two games. So, the Eagles have split their first two games against Carolina on the road and New Orleans at home. Sounds perfectly logical. It is what I would have predicted. Given these opening games, no matter who they shook out, 2-0 would have been fantastic and 0-2 would have been relatively scary. So, the record is not surprising–and goes along in telling us nothing. The defense looked very, very good Week One against what should be a pretty good Carolina offense–Jake Delhomme notwithstanding–particularly at home. The Panthers were 12-4 last year and 8-0 at home, and they have every offensive starter back from a year ago. The defense forced seven turnovers and, aside from a touchdown on the opening drive, basically pitched a shutout. Then, the defense looked very, very bad Week Two against New Orleans. Now, is it simply the fact that, right now, no one is going to stop Drew Brees and Company in decent conditions? Or, are there problems with the defense? The linebackers that looked SO good against the Panthers looked just as bad against New Orleans. After the first game, you would say that Stewart Bradley’s loss was not big. After the New Orleans game, you are lamenting that loss. So, is the defense good and New Orleans is just great (the Saints did score 45 in Week One)? Is the defense bad and Carolina just had a bad day (Delhomme did turn it over 6 times against a bad Arizona defense in the playoffs last year, and the Panthers did just lose to Atlanta this week)? Or, do we know nothing about the defense and its new coordinator, new/old middle linebacker, and brand-spanking-new free safety (a guy who has never played safety in his life and is replacing the best free safety of my lifetime)? So, in a 38-point “exposion,” the offense had ONE scoring drive of more than 3 plays…ONE. But, you can’t fault them for the great field position handed to them by the Panthers. So, I am, by NO means, criticizing the offensive performance in Week One, I am just saying that we didn’t really learn anything about them. Then…Week Two. 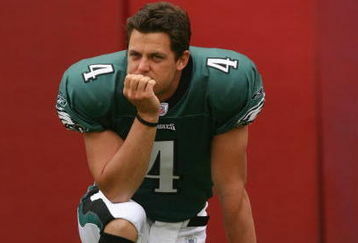 Kevin Kolb actually looked decent in the first half. And, he did throw for 391 yards. But, do we know anything about him? I think the only thing we learned is that he might not be totally awful. And, then there is Brian Westbrook. Is he the Westbrook of old? Probably not. But, how close is he? I cannot believe he is done, though we haven’t learned anything to the contrary in the first two weeks. In fact, much less the entire rest of the team…we haven’t learned anything. And, I’m guessing that we won’t still won’t know anything until it is nearly Halloween. The Eagles should be able to get a W against Kansas City, at home, regardless of the quarterback this week. Then, they have their bye in Week Four, before playing a terrible Tampa Bay team at home and then travelling to Oakland on October 18. There is a chance that we learn something from the Oakland game, but maybe not. Chances are the first time we can actually say, for sure, that this team is -fill in the blank- will be Monday, October 26, after a game at Washington. And, we/they better figure out quick just who they are because that game is followed by back-to-back home games against the Giants and Cowboys followed by road trips to San Diego and Chicago. And, it just doesn’t ever lighten up, either, as the following week is Washington at home then Atlanta on the road before finishing up at the Giants, home to San Fran and Denver and, finally at Dallas. So, heading into that Washington game, it is imperative that whether or not was “know” anything, this team had better be at the very least 3-2, and it may actually be necessary that they are 4-1 because this division will not let up. Currently, the three Eagles quarterbacks that did not start against the Saints (and probably won’t against KC, either) have combined for twelve Pro Bowl appearances. The starter, obviously, has been to zero. McNabb-5, Garcia-4, Vick-3. With all this Shawn Andrews drama (which ended last week with his being placed on the IR for the seasons), it begs the question of why did the Eagles decide to move both Andrews brothers from their natural positions? I know they believed Shawn to be a future tackle, but he was a Pro Bowl guard, while Stacey was a decent tackle. AND, the big kicker is that they couldn’t possibly be certain that Shawn was going to produce this year. So, why open yourself up to a hole at tackle??? Now, because of that “switch,” Stacey is playing an unfamiliar position, and Winston Justice is the first-string right tackle. Kind of botched that one, huh? Another thing that I was harping in the offseason is why did they not pick up a veteran running back while they could be brought in and taught the offense? I don’t think Westbrook is done, but you cannot possibly think that he’ll give you 250 carries this year, right? And, I like LeSean McCoy, but why not go get an Edge James or Warrick Dunn or someone? I don’t think it’s too late, either. Reggie Brown is useless and teams aren’t even offering a seventh-round pick for him. Bite the bullet and drop Brown and go get another running back. Now, I’m not going to criticize too much because I trust the Eagles evaluation of older players and when they are through, so have to cut the some slack on that front. But, it is a bit ironic that Quentin Demps is so far in the doghouse that he’s not even being considered for the starting free safety position. It remains to be seen whether the departure of my favorite all-time Eagle is going to hurt the Eagles in the clubhouse, but I think that it’s clear that, whether or not Brian Dawkins can still play, the Birds have a pretty big hole at the position he used to so admirably fill. Macho Harris is a cornerback–and always has been. That is not saying he cannot become a solid NFL safety, but it’s obvious that he’s not there yet. An exciting Week Seventeen ends another fantastic NFL season, and now we enter the always fantastic NFL playoffs. I tried to set the “schedule” from how I think the NFL/TV networks would set it up. A bruising Ravens defense led them to another 10-win season and another playoff appearance. But, they run into the Colts in Indy on this Wild Card weekend and fall just short. Tied at 13 in the 4th quarter, Manning is able to engineer a couple big second-half drives, including a late touchdown to ice it. The Colts move to another playoff duel with the Patriots. The Cowboys defense bends, but doesn’t break in the first half, and the offense puts together three touchdown drives in the second half to win going away on the road. The Niners have a nice season, but the Cowboys end it today. This is the first playoff win for this storied franchise since 1996. A cold Green Bay day. A rematch of the NFC Championship Game of two years ago. A different result. Eli Manning has a ton of trouble doing anything in this weather, while the Packers stack the line of scrimmage against the Giants running game. Aaron Rodgers and the rejuvenated Packers, who are probably still upset that they even have to play this weekend after blowing a chance at the top seed in Arizona last week, solve the Giants defense just enough to get them through this opening round and headed for a date with the Saints in the Divisional Round. The Texans accomplished a lot this season and are just happy to be here. In San Diego, with the Chargers figuring out the early-season struggles and are now hitting full stride. At home, they should dominate the inexperienced Texans and not give Norv Turner a chance to blow it at the end. Norv Turner is able to blow this one at the end. Both teams come out fired up and play right with each other for two and a half quarters. Then, the Chargers take a 23-14 lead early in the fourth quarter. The Champs respond with a couple defensive stops, a field goal to cut it to 6, and then a game-winning scoring drive to win it. The AFC Championship Game is heading back to Heinz Field for the second consecutive season. The Saints outgain the Packers by well over 100 yards of total offense, but a couple turnovers and an opportunistic Packers offense that converts all four red zone trips into touchdowns send the Pack to the NFC Championship Game for the second time in three years. The Saints are left to wonder what could have been in a game they won in every facet except the final score. Two hated arch-rivals meet with a trip to the NFC Championship Game on the line. The Cowboys, who beat the Eagles in Week Seventeen just to make the playoffs are feeling confident, until the opening drive, when the Eagles streak down the field and go up 7-0 less than 3 minutes into the game. The Cowboys answered right back, but the Eagles kept on the pressure and took a 24-14 lead into locker room at halftime. They added another touchdown in their first drive of the second half to go up 31-14 and never looked back. The Birds will go to their 6th NFC Championship Game in the 11 years under Coach Reid. Old familiar foes in the AFC Playoffs go at it one more time this year. A wild, high-scoring game, despite the nasty weather in Foxborough ends with another Patriots victory. Both teams enjoyed double-digits leads at some point in this game, but it just seemed like the last team with the ball would win. Unfortunately, for the Colts, Manning throws a fourth-quarter interception on the drive that should have tied the game. The Patriots will move on to Pittsburgh to face the Steelers for a trip to the Super Bowl. The Eagles are going back to the Super Bowl! The Packers run falls just short of an NFC Championship, while the Eagles are catching the stride and playing their best football at just the right time. 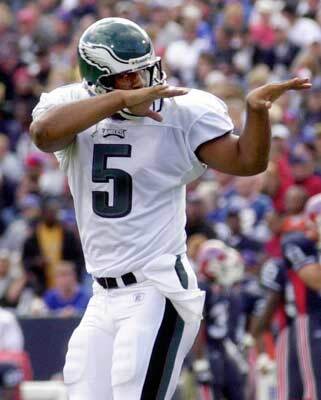 Another big day for Donovan McNabb, as the Eagles win the game with relative ease. Now, they await to see whether it will be a rematch of Super Bowl XXXIX or whether it will be an All-Pennsylvania affair down in Miami. Back-to-back champs and seven Super Bowls for the Steel City. The McNabb-led Eagles fall just short again, though this time no one can possibly blame the quarterback. Against the league’s best defense, McNabb has a stellar game, throwing 4 TDs and 0 INTs. But, the Steelers offense emerges under the bright lights and puts up big numbers. McNabb led a late touchdown drive to tie it with just under two minutes to go, but Roethlisberger, yet again, leads his teams down the field with a couple big screen plays to Willie Parker. With just :35 seconds left, the Eagles stuff Parker on a 3rd and 1 at the Eagles’ 31-yard line, but with no timeouts left for the Birds, the Steelers are able to wind the clock down to just :03 seconds left and call their final timeout. With overtime looming, Jeff Reed boots a 48-yard field goal as time expires and the Steelers are Super Bowl champs again. A devastating finish to a very successful Eagles season. Okay, well Week Sixteen brought us a lot more answers to the playoff questions. In fact, there doesn’t seem to be as much drama in this final week as there normally is this time of year. There are a couple big-time situations, though. Saints vs. Panthers – winner wins NFC South; if Saints lose, they are almost definitely out; if Panthers lose, they will still get Wild Card if Dallas loses. Yes, the Niners actually have nothing to play for. And, yes, they have clinched the NFC West and, therefore, a playoff game next week. But, I don’t see Singletary resting people. I think he would like to continue the winning spirit in San Fran. I think that he will be on his guys even more so this week because the playoffs are only a week away. Give me the Niners in this one, as they prepare for the playoffs. Basically, a playoff game. The winner has a great shot at a wild card, while the loser is going to miss the playoffs. In a rematch of a Week Seventeen game last year (that was not exciting because the Giants pulled their starters halfway through), I think that the Giants are just much better prepared for this moment. With the season on the line, this team will respond. And, since it’s a dome, they don’t have to worry about Eli in the cold (not a good thing). The Vikings and their aging, fatigued quarterback will not. An utterly disappointing season for Minnesota ends at home in Week Seventeen. The Jack Del Rio Era in Jacksonville ends with a whimper in Cleveland. The Browns are still playing hard and actually finish with 5 wins in their last 7 games. Not a bad first season for Mangini. The Steelers have everything locked up, so most of the starters probably will not play. The Dolphins are still well-coached, despite a bit of a disappointing year, and they should respond and finish with a win at home. The Patriots are locked into the 2-seed, so you won’t see many starters on the field in Houston. Which is great news for the Texans, who are in a win-and-in scenario. With the win today, they clinch a Wild Card in the AFC. The Falcons have one last gasp in them, as they close out probably the most disappointing year of any team in the NFL this year. Tampa wasn’t exactly gangbusters, either, finishing at an abysmal 2-14. Winner-take-all game. The winner wins the NFC South. Period. I believe that the Saints will go into Carolina and win this all-important game, capping a great divisional comeback, winning their final 4 games to win the division. And, once again, in the NFC South, the last-place team from a year ago wins the division this year. I just like the Saints offense in a must-win game. This could be one of those “team with the ball last wins” kind of games. Either way, this is a great Week Seventeen matchup. The Panthers now need help around the league or they may be watching the playoffs from the golf course. Also, the Saints win eliminates the Vikings. The Jets salvage a 5-win season, as they hammer the Bengals here this week. The Bengals go 2-14, and Marvin Lewis is out of a job. The Eagles are one win away from securing homefield advantage throughout the NFC playoffs, but Dallas is one loss away from be eliminated completely. This, another Week 17 rematch from last year, may go the other way, as the Cowboys get a must-win and clinch a playoff berth. The Eagles would love to knock their arch-rivals out of the playoffs in Week Seventeen for the second straight year, but I think the Cowboys will actually get it done this December. But, though they don’t know it at the time, the Panthers loss to New Orleans gives the Eagles at least a first-round bye regardless of this result and still have a shot at the top-seed, depending on what happens in the desert later today. We all know what happens when the Colts have something clinched. They play nobody. This will be an easy win for the Bills who, techically, are still alive when this game kicks off, though it would take a near miracle for them to make the playoffs. When this game kicks off, the Bears, like the Bills, are techincally still alive (though it would take a ridiculous combination of events), but unlike the Bills, the Bears are not facing a team whose only concern is resting its stars. The Lions, though not very good, are still playing hard. They are at home, and they probably view this game as a way to knock the Bears out of the playoffs. On the other hand, the Bears probably don’t really believe much in their chances, anyway. I like the Lions in a relatively easy win to end their season. The Bears, even with their superstar quarterback, finish 8-8. The Chargers have nothing to play for. They have the NFC West wrapped up, but cannot catch any of the other division leaders. They are locked into the 4-seed and a home game next week. So, they will not be playing any of their starters. The Redskins, however, will be playing their starters, but…because of the results of the early games, they will know (at least by the middle of the first quarter) that their season is over. They went 1-4 against the other three teams that are tied with them for the Wild Card, so they cannot win a tiebreaker with the other 10-6 teams. A good season ends without a playoff spot for the Redskins. The Ravens are in a must-win situation, and they get the Raiders, who are out. The Ravens, who really know how to get fired up for big games, know that they only need to win this game and they are going to the playoffs. They should come out with a fire in Oakland and win this game handily. Which team is more likely to still be playing hard? This one was easy. The Eagles, with their loss in Dallas, have become the biggest fans of the team that beat them in the NFC Championship Game last year. The Eagles need a Cardinals win here or they will fall to the 2-seed and may be facing Green Bay in Wisconsin for the NFC Championship instead of at The Linc. And, though the Cardinals have nothing left to play for, after being eliminated last week, I think that they show up here at home and shock the Pack. There is still some pride on this Cardinals team, and they matchup well against the Packers in Arizona. This Packers loss is devastating because not only do they lose a shot at homefield advantage throughout the NFC playoffs, but they also lose the bye and now have to play on Wild Card weekend against another 10-6 team. The Titans caught a big break last week, when the 49ers clinched the NFC West, thus eliminating the Seahawks. This gives Tennessee a much better shot of going into Seattle and getting a must-win game in the final week of the season. At the beginning of the day, the Titans needed a win and either a Baltimore or Houston loss to get a Wild Card. They know, by now, that the Texans have won, but the Ravens also have a late game, so they are not out of it. They will be playing hard and should get out of here with a victory. This is a great Christmas Day matchup between two very good teams, both still vying for playoff positioning. It is hard to say which is worse on Christmas Day–travelling away from home the night before or having to leave your family on Christmas morning to go play a game. I think the travelling is slightly worse, but I’m not sure. Either way, I think that coaching plays a big role in games like this and that is why I am going to go with the Titans in a close one on Christmas Day. A home game with a bad team, whose season is over, two days after Christmas is exactly what the Saints need in this must-win situation. This should be an easy 9th win for New Orleans, keeping them in the hunt going into the season’s final week. Week Fourteen finally saw the Birds take their rightful place atop the NFC East, while Green Bay and Minnesota still battle for the North. San Fran and Carolina still lead their respective divisions. The Steelers and Patriots have both clinched division titles in the AFC and are clearly heading for first-round byes. The Chargers are taking control out West, whil the South shows the Colts one game ahead of Houston and two up on Tennessee. Three games to go, and it is getting tense in cities like New Orleans, Chicago, Buffalo, and the entire NFC East. Another season, another double-digit win total for the Indianapolis Colts. And, this win could go a long way to giving them another AFC South title. The Jags are reeling coming off of back-to-back losses to Houston and Miami, and even though they tend to play the Colts tough every year, at this point in the season, they probably won’t need the game quite as much as Indy. Plus, with the short week, give the advantage to someone like Peyton Manning, who is the consummate professional. Another brutal December game for the Cowboys. The Saints are trying to save their season in this one, at home, in primetime. I’m not completely sold on the Cowboys falters in December being anything much more than coincidence up to this point, but after yet another year of hearing about it (and, much more importantly, this brutal schedule), they might start thinking a little too much this time of year. In a tough one to call, give me the Saints at home. A real interesting Week Thirteen opened the month of December. The NFC East has four 8-4 teams (two games better than the division leaders in the NFC West). The defending NFC champs are still in it, despite a 5-7 record. The Steelers and Pats continue to run away with the byes in the AFC, while the South is getting real interesting. Week Fourteen will be big, especially the Sunday Night game between the Eagles and Giants. The last gasp of the Browns season goes out against the Steelers. A short week definitely favors the better coached and more physical team–both of which are the Steelers in this one. The Dawg Pound is tough, at times, especially in night games, but the Steelers are rarely intimidated, and they move to an impressive 12-1. At 3-9, the Falcons have nothing left to play for, while the Saints, at 6-6, still have playoff hopes. This won’t be an easy win for the Saints, but when it comes down to it, they should pull it out. A 10-loss season is not what the Falcons had envisioned coming in, but that is the reality they are facing. This one is tough to call because it’s hard to know just when, if at all, the Falcons will quit. This is a tough game, either way. Both teams are coming off tough wins against division rivals (Tennessee and Kansas City), but here in Indy, I don’t think the Broncos will have the firepower to keep up with the Colts, who are trying to keep control in the AFC South. This loss is a tough blow to the Broncos playoff hopes. I want to pick against the Bills for selling out their home city, but I think they are a better team than the Jets. Plus, by this point, the Jets are pretty much done, whereas the Bills are right there with a shot at a playoff appearance for the first time in many years. The Bears really need this game, while the Rams are done. Throw in the homefield advantage that comes from a December game in Chicago, and this one is a pretty easy call. Though, if the weather is nice, I do like the Rams offense matched up against the Bears defense, but the weather will probably not be nice.